Hayley graduated from the University of the West of England in 2008 with a BSc (Hons) degree in Animal Behaviour and Welfare. Soon after this she realised that her interests extended to veterinary medicine. 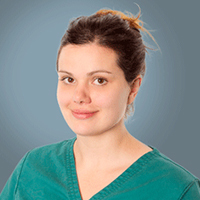 She joined SCVS in 2009 as an Animal Nursing Assistant and went on to train as a student nurse here. She qualified in January 2013 and worked as a rotation nurse for a number of years, gaining vital experience in all areas of referral nursing. She completed extra qualifications in wound management and later went on to achieve the BSAVA Merit award in medical nursing. She has now been promoted to a senior nurse and splits her working time between the medicine, imaging and wards departments. She has a special interest in providing strategies to minimise stress in hospitalised patients, ensuring the welfare needs of the patients are met during their stay.